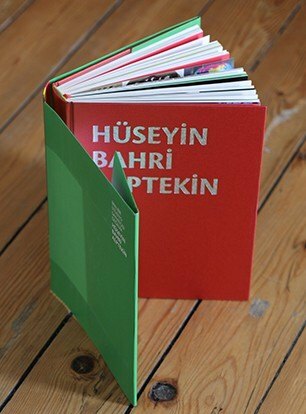 Hüseyin Bahri Alptekin (İzmir, 1957-2007) studied aesthetics, philosophy of art, and sociology in Ankara and Paris. He worked as a photographer for SIPA Press and wrote for various publications as an art and design critic. Alptekin lectured at Ankara Bilkent University and Istanbul Bilgi University. Starting in the early 1990s, Alptekin focused on an artistic production that explored the effects of globalization, immigration, and exile, cross cultural image circulation and anonymous production through travel, personal histories, and archives. In 2007, Alptekin represented Turkey in the 52nd Venice Biennale with his installation “Don’t Complain” and participated the exhibition “Global Cities” at the Tate Modern in London. 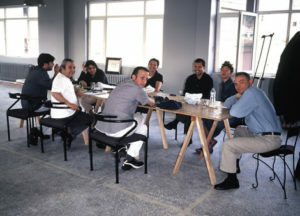 From 2000-2004, he ran a non-profit artists’ collective called “Sea Elephant Travel Agency.” He was involved with various collectives and collaborative work, including his early work with M D Morris, Grup Grip-in that he founded with his students at Bilkent University, the meetings arranged at LOFT, the Bunker Research Group and Barn Research Group (BRG). The artist’s solo exhibitions are “I Am Not A Studio Artist”, SALT, Istanbul (2011), “Global Mockery”, Maison de Folie de Wazemmes, Lille (2009), and “Kriz: Viva Vaia”, Dulcinea Gallery, Istanbul (1999). Exhibitions he participated in include 2nd and 3rd Tirana Biennial (2003, 2005); the Istanbul Biennial (1995, 2005, 2009); Manifesta 5, San Sebastian (2004); “How Latitudes Become Forms”, Walker Art Center, Minneapolis (2003); Cetinje Biennial (2002), for which he won the UNESCO Prize; the São Paolo Biennial (1998). Huseyin Alptekin’s work aims to embody some of the strings of connections that link the distant, recent past with today. knowledge of the world geography and history. He picks up portable ideas and images, which travel of their own accord, with their own energy, and re-directs them a little, or adds to our vague knowledge – reminding us of a place called Surabya is and that Kurt Weill sang about in Weimar, Germany. Alptekin hates to be alone. Wherever he is he surrounds himself with people. In new countries and cities he strikes up conversations with strangers, constructing a temporary group to be part of, befriending the keys to get to the heart of the city or country. In a professional way he also devises forums to achieve the transit of communication and discussion, orchestrating and choreographing artists, and others to produce works and ideas together. The most comprehensive exhibition of Alptekin’s work to date, “I Am Not a Studio Artist” 2011 at SALT Beyoglu included nearly fifty works in collage, neon, video, photography, sculpture, and installation. Some had been lost for years, but were carefully reconstituted from the materials found in what the exhibition’s curator, Vasif Kortun, calls “the organized chaos” of Alptekin’s archive, or re-created according to the artist’s notes.